Apple on Tuesday reported that it sold 3.72 million Macs in its third quarter, which spanned April 1 through June 30, the fewest in any single quarter since it sold 3.47 million in the third quarter of 2010. It's also the first time Apple has sold fewer than four million Macs in a quarter since the third quarter of 2013, a span of five years. Apple reported sales of 4.29 million Macs in the same quarter a year ago, so this is a pretty significant 13 percent decline on a year-over-year basis. Mac revenue also dropped five percent over the year-ago quarter. There are a number of possible explanations for the decline, including consumers increasingly shifting towards the iPhone and iPad. 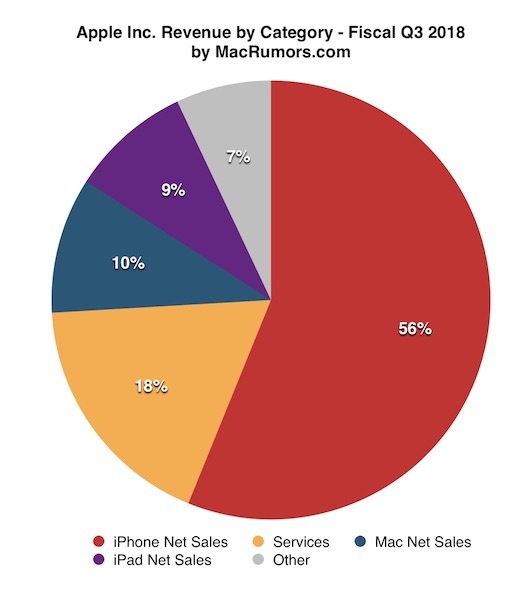 Together, those devices accounted for 65 percent of Apple's revenue last quarter, compared to just 10 percent for the Mac. Apple even markets the iPad as a computer replacement. The bigger reason, however, may have been that nearly the entire Mac lineup was outdated last quarter. Beyond the iMac Pro, released four months before the quarter began, no other Mac had been updated since 2017 or earlier. Apple hasn't updated its 12-inch MacBook and iMac lines since June 2017, while the MacBook Air has gone unchanged since March 2015, except for a minor increase in clock speed on the base model last year. Worse, the Mac mini hasn't been refreshed since October 2014, and the Mac Pro has gone unchanged since December 2013 while Apple works on a new modular version for 2019. While the MacBook Pro was recently updated, the new models didn't launch until 12 days after the third quarter ended. Last year, new MacBook Pro models launched at WWDC in early June, well within the third quarter. Our year-over-year sales performance was impacted by the different timing of the MacBook Pro launch, which did not occur until early Q4 this year as opposed to June last year. The month-later MacBook Pro refresh isn't enough to justify Apple's fewest Mac sales in any quarter since 2010, however, as the notebook has been updated at various times over the years. 2016 models were released in October of that year, for example, while 2013 models launched in February of that year. Apple said it still recorded double-digit year-over-year growth in its active installed base of Macs last quarter, reaching a new all-time high, with nearly 60 percent of purchases coming from customers who are new to the Mac. Fortunately, updates to the rest of the Mac lineup should be on the horizon. Apple analyst Ming-Chi Kuo expects the 12-inch MacBook, Mac mini, and iMac to be refreshed later this year, while a new entry-level notebook could replace the MacBook Air. And, as mentioned, Apple says a new Mac Pro is coming in 2019. Maybe folk aren't buying due to the ever increasing prices? This is no accident, this is by design. Despite what they say, Apple just doesn’t care about the Mac platform. I’m afraid Apple will use this as an excuse to focus even less on the Mac. But in there defense, those "important" emojis keep on coming! Tim Cook is the worst thing to happen to Mac since Mac. Apple has been lazy and complacent with their Mac line up, so lacklustre sales are no surprise. Lesson Apple should take: Keep the Macs updated. Lesson Apple will take: People don't want Macs anymore. Maybe they need to stop being stubborn and start listening to what customers want? They could pull off that kind of attitude 10 years ago when PCs were complete garbage so apple customers didn't even consider making the switch. But have you looked at what Dell, HP and Lenovo are putting out these days? The competition has seriously stepped up their game and are quickly becoming a compelling option for people who are not tied to final cut. If they don't start designing systems that people have been asking for and cutting their prices a bit, they are gonna lose a ton customers.